This blog post is marked as an AD (advert) because I received a £10 Tesco voucher to use to purchase ingredients in exchange for creating this content and the brand I worked with had editorial control over the content. I aim to be transparent in order to retain your trust and I hope you will continue to support the Thrifty Mumma Thrifty Bubba blog and social media channels. In today’s post I have a thrifty, healthy recipe to share with you which is quick to prepare and delicious in taste. I was recently invited to take part in the #MeatMatters challenge sponsored by Simply Beef and Lamb. I was excited by this idea as I’ve always enjoyed cooking and I like to find healthy, thrifty ways to enjoy main meals. Greek food has long been my favourite and so I chose to make Pastitsio – a traditional Greek dish reminiscent of lasagne but with a twist! Have you tried it before? With Easter approaching and spring in the air, lamb was a natural choice for my Greek Pastitsio. Did you know lamb provides four essential vitamins that help to reduce tiredness and fatigue? As a parent this fact was music to my ears! Pastitsio is a versatile dish which you can alter depending on the ingredients you already have in your fridge and in your kitchen cupboard. First, preheat your oven (200C, 400F, Gas Mark 5) before adding the macaroni to a large saucepan and cooking it according to the instructions on the packet. Next, in a large frying pan, fry the onions until softened and add the garlic using a garlic press. Add the mince to the pan and fry until it turns brown. Then, add the carrots and mushrooms. Stir thoroughly. After that, add the herbs except for the nutmeg and cook through. Your kitchen will begin to smell amazing at this point! Stir in the tinned tomatoes and tomato puree. Simmer on a reduced heat. In the meantime, drain the macaroni and leave it to cool. To make the white sauce, mix the yoghurt, quark, eggs and nutmeg together thoroughly. In a large lasagne dish (or similar) cover the bottom of the dish with a layer of the meat mixture. Add a layer of macaroni and then pour over the remainder of the white sauce. Bake until the white sauce has turned golden brown. Remove from the oven and serve! As you can see the recipe is super simple to follow and it is so effective. This is the perfect dish to make when you are expecting a large number of visitors – you could even try it this Sunday for Mother’s Day! 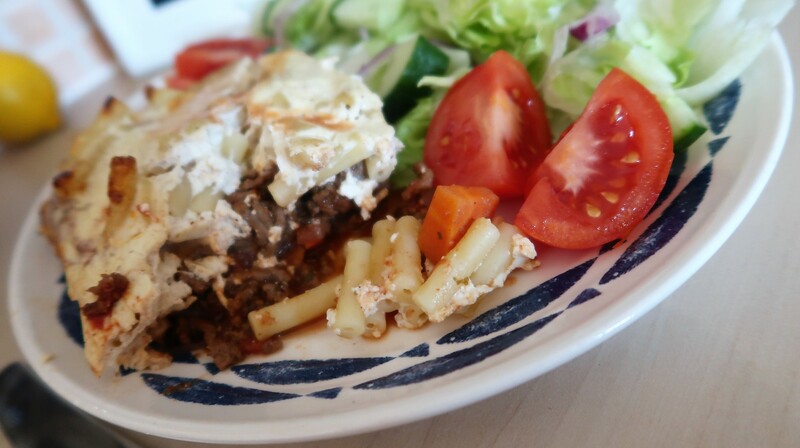 Pastitsio is a hearty dish that brings people together – with a healthy, thrifty twist this dish is guilt free too! I decided to pair my dish with a large Greek salad full of juicy red tomatoes, sharp red onions, black olives and creamy feta cheese – it’s the perfect self serve food! To follow on with the Greek theme you could even add a starter of Greek dips (Houmous, Taramosalta, Tzatziki, Melitzanosalata etc) and pitta bread. What’s your favourite dish that is healthy yet cheap to make? Have you ever tried Pastitsio? I’d love you to leave a comment below telling me your top beef and lamb recipes! As always, thank you so much for reading and supporting my blog. Are you a social butterfly? Follow me on Facebook, Instagram and Twitter – don’t forget to subscribe to my YouTube channel too!